This month there will be non-stop music from 8.30 through till 11.00 p.m. And it would be great to see you there. A location map and other details are on the band's website, but as a further aid to getting there Ron gives a satellite navigation reference, LE67 5PH. The band are also on MySpace. Gdzie, jak nie w Bühl, w Badenii mógł się odbyć jubileuszowy koncert z okazji dziesięciolecia istnienia European Blugrass Music Association? Thanks to Walter Fuchs, music director of the Bühl International Bluegrass Festival in south-west Germany, for the news that Polish journalist Pawel Minakowski was in Bühl on Saturday 19 February to attend the concert marking the 3rd European Bluegrass Summit, the first year of the German Bluegrass Music Association, and ten years of the EBMA. His report, together with several photos of the bands taking part in the concert - Monroe Crossing (USA), 4 Wheel Drive & Jolanda Peters (D/NL/B), and G-Runs 'n Roses (CZ) - has since been published on the Polish country music website Muzyka-country.pl. 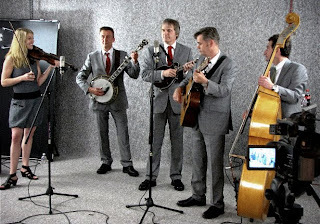 More press coverage of the Summit and the concert will be reported in the European Bluegrass Blog in the next few days. 'Where would we be without the foresight and energy of Paolo Dettwiler?' These words begin a major feature and interview by Richard F Thompson in Bluegrass Europe #78 (Feb.-Mar. 2011) - the last issue to be edited by Paolo Dettwiler, who founded the magazine and has published and edited it for thirteen years. Paolo has been the driving force behind many other initiatives for bluegrass music in Europe and abroad, in positions that include founder member and president of the Swiss Bluegrass Music Association, founder member and chairman of the European Bluegrass Network and EBMA, and international board member of the IBMA. 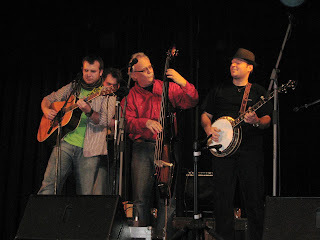 He is the talent organiser for the annual Spring Bluegrass Festival Willisau, and recently resumed playing music with his father as members of the reactivated Country Pickers (CH). Paolo contributes a valedictory editorial to Bluegrass Europe #78, which is also the last issue to appear in conjunction with the German-language magazine Bluegrass Bühne and the Dutch Strictly Country (where Rienk Janssen is retiring after forty years as editor). The first magazine to be devoted to bluegrass music throughout Europe, Bluegrass Europe remains unique and will continue as a quarterly under a new editorial team with many new features, free to members of the EBMA and available on subscription to non-members. For more details, see the Bluegrass Europe page on the EBMA website. The long-standing 'special relationship' between the European Bluegrass Music Association (EBMA) and the European World of Bluegrass (EWOB) Festival was brought to a friendly conclusion during the 3rd European Bluegrass Summit (18-20 Feb. 2011), held at Bühl, Germany. 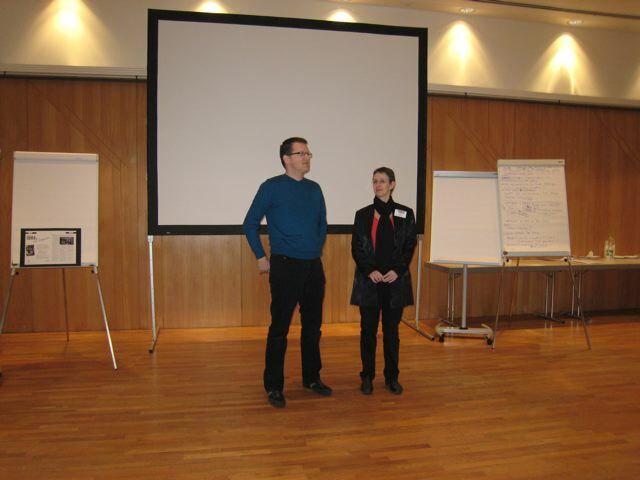 The photos (taken by Lilly Pavlak) show Ronald Groot, representing the EWOB Festival organising committee, and Angelika Torrie, representing the EBMA board of directors, announcing the development on the final morning of the Summit in the conference room of the Bürgerhaus Neuer Markt, which was generously made available for the Summit by the city council of Bühl. The two organisations will continue to cooperate while pursuing their separate objectives, and the European World of Bluegrass Festival has become a founder member of the EBMA's Festival Network. More details of the EBMA Festival Network will be published soon. The 14th EWOB Festival will be held on 2-4 June 2011 in 't Trefpunt, Voorthuizen, the Netherlands, which has been the location of the Festival since 1999. More photos from the 3rd European Bluegrass Summit can be seen in an album on the EBMA's Facebook page. 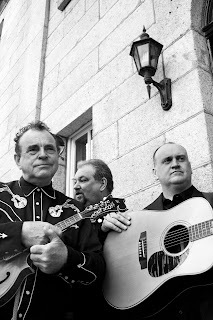 From next month the show will permanently be called 'Butler's Boudoir Bluegrass' to help save confusion, but don't worry for those around the world. Yes, the show will be more focused on UK and European bluegrass music; I will put aside 15 minutes or so within the programme to feature music from around the globe too. I do hope you will continue to join me each week. Also, please check out Facebook for all the information relating to the UK bluegrass scene with links to the European scene. Please forward this message to anyone you think might be interested in joining the group too. 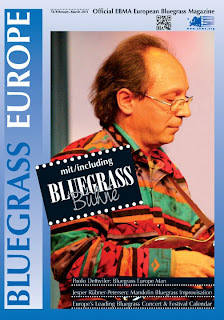 Had a great time at the EBMA summit and brought back with me more bluegrass music from Europe that I have not played on here before - I know you will enjoy it all. I shall keep you posted of further links to find out about what's going on in the bluegrass world of music here in Europe and the US, as and when they are available to me. Meanwhile please post all your information, photos, gig dates, etc. onto this group's wall - that includes all you festival organisers. Let everyone know. Have a great week , have fun! 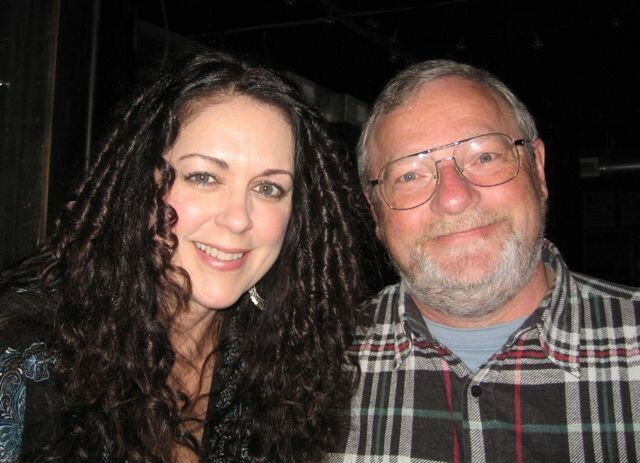 For more about Lynne, see the Prescription Bluegrass Blog. "I'm sorry to report that on Saturday 29 january 2011 a Weber Big Sky Mandolin (serial number 161301) was stolen out of our store showroom. Must have been hidden under a large coat as the case and the warranty card is still in our storage room. 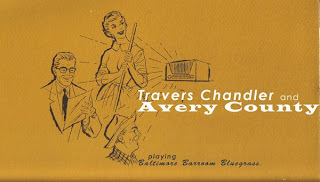 Please let me know if ever somebody hears something about the whereabouts of this beautiful instrument." Thanks to the Prescription Bluegrass blog in Colorado, USA, for the news that an EBMA member has recently founded a new 24-hours-a-day bluegrass radio station, Bluegrass Planet Earth. 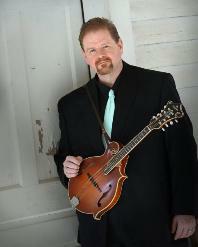 The member is Colonel Tom Taylor (see the European Bluegrass Blog for 15 Apr. 2009). 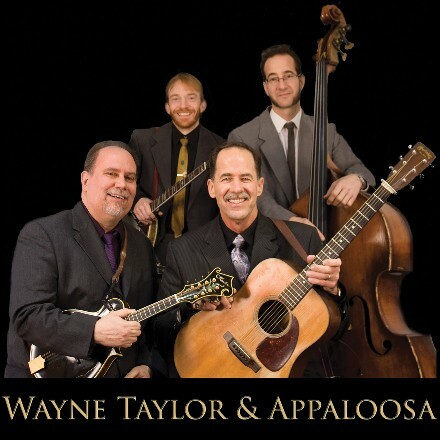 Read more about Col. Taylor and Bluegrass Planet Earth here. 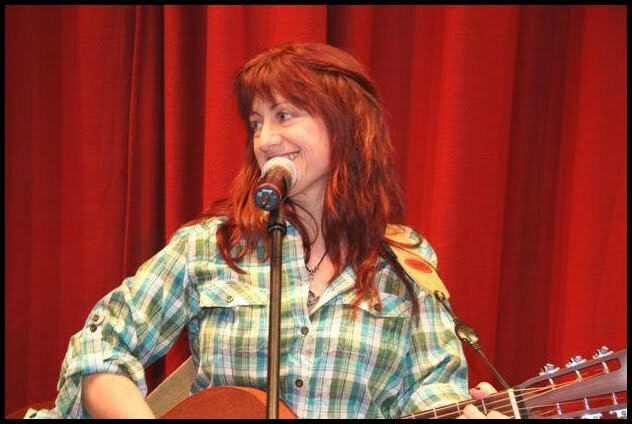 Gabrielle Gray, director of the International Bluegrass Music Museum in Owensboro, KY, reports that the IBMM will host an evening of music and light refreshments tomorrow (Tues. 15 Feb. 2011) at 7.00 p.m., as part of its Centennial Concert Benefit Series. The Coal Porters (UK; above left), led by Louisville native Sid Griffin, will provide the music, as part of their 2011 Winter American tour. 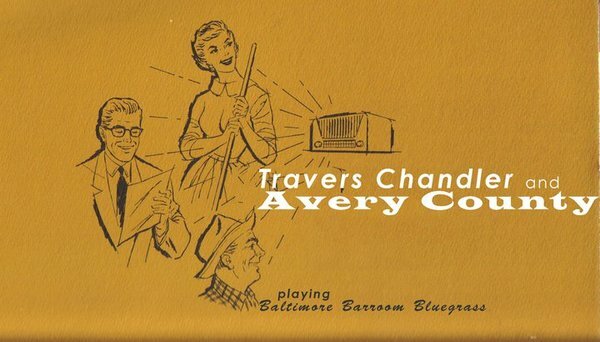 The concert will be broadcast live on Radio Bluegrass International, the museum's free online radio station, and will also be recorded and broadcast at a later date by public radio station WNIN. Read more in the IBMM's latest e-newsletter. The Acher- und Bühler Bote newspaper in the Baden area of south-west Germany contains a half-page interview by Klaus-Peter Maier with Angelika Torrie, chairperson of the EBMA, about the forthcoming 3rd European Bluegrass Summit, which will be held in Bühl on 18-20 February 2011 with a record attendance of almost fifty participants. 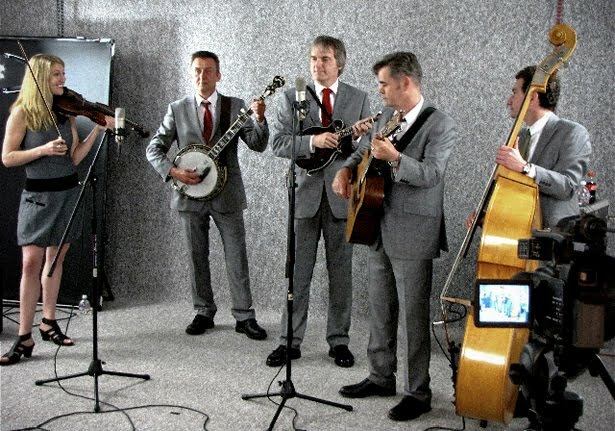 The interview also mentions the role of the EBMA after its first ten years, the new German Bluegrass Music Association, the Bühl International Bluegrass Festival, the continuing appeal of bluegrass music 100 years after the birth of Bill Monroe, and the concert which will form a high point in this year's Summit. There are also photos of Angelika Torrie and of 4 Wheel Drive, who will be part of the concert lineup on 19 February. Read the whole interview (in German) here. More media coverage can be seen on the Summit page of the EBMA website. The 16th Annual Steve Kaufman's Acoustic Kamps will take place in two successive weeks (12-18 June 2011 and 19-25 June 2011) at Maryville College, Maryville, TN, USA, seventeen miles (27 km) south of Knoxville, TN. The $800 tuition fee includes room, meals, classes, concerts, workshops, clinics, and tons of jamming. The Flatpicking Team for week 1 includes Tyler Grant, Jim Hurst, Steve Kaufman, Robin Kessinger, Marcy Marxer, and Roberto Dalla Vecchia. The Flatpicking Team for week 2 includes J.P. Cormier, Mark Cosgrove, Dan Crary, Beppe Gambetta, Mike Kaufman, Kenny Smith, and Uwe Kruger. Steve Kaufman's Acoustic Kamps have regularly won the Gold Award voted by readers of Acoustic Guitar magazine. More details and downloadable registration forms are here. 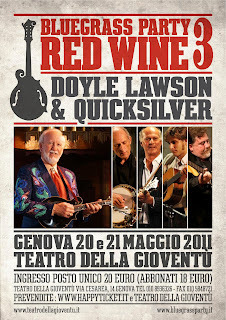 Thanks to Martino Coppo of Red Wine (I) for this announcement of the Third Red Wine Bluegrass Party. 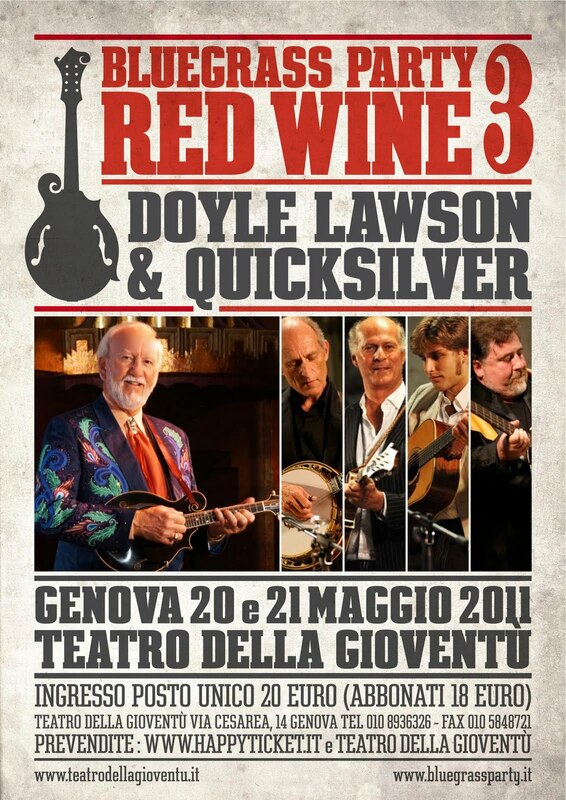 The Party, with Red Wine as hosts and Doyle Lawson & Quicksilver (USA) as illustrious guests, will be held on two successive nights, Friday 20 May and Saturday 21 May, at the Teatro della Gioventù, Via Cesarea 14, 16121 Genoa (Genova), Italy, beginning at 21:00. For details of booking, click on the poster image for an enlargement. A location map for the theatre is on the Party website. 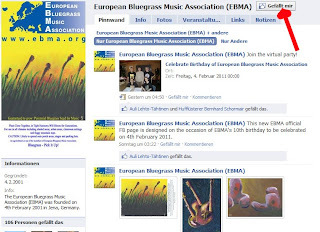 I just finished designing a new Facebook as a birthday present on the actual 10th birthday of EBMA (4 February 2011). If you have a Facebook profile, please check it out and 'like' it. If you are interested, you can follow our blog on twitter: if you follow @ebma_tweet, you'll get a tweet each time a new post goes on this blog. Thank you for following EBMA! a truly remarkable man whose quirky musical tastes have really made a difference in my life. The newsletter also gives a link to a recent New York Times article by Larry Rohter about Chris Strachwitz, born in Germany (1931) into an aristocratic family as Count Christian Alexander Maria Strachwitz. The Niall Toner Band (IRL) is now represented in the USA by the Mountain Music Entertainment agency, which has a distinguished roster of American bluegrass artists. 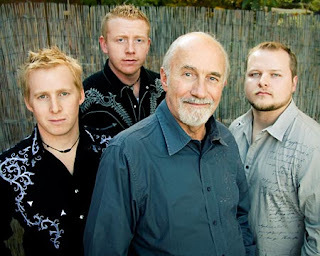 Mountain Music Entertainment has just issued a release about the band for US bookings, with the image shown on the left and a link to a video documentary on the band. Read the whole release here. The organising committee of the Spring Bluegrass Festival in Willisau, Switzerland, has announced the full programme for the 12th edition of their successful event. Their updated website features short presentations of all bands appearing (in German). 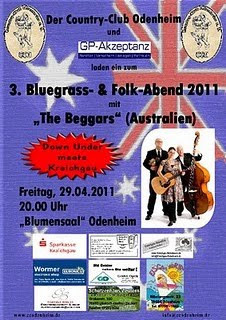 The 12th Spring Bluegrass Festival takes place on 28 May 2011 at the Swiss Agricultural Museum in Alberswil, next to Willisau, Canton Lucerne, Switzerland. Advance ticket sales have been strong so far and a sold-out festival is likely. The organising committee is looking forward to meeting old and new friends as well as a formidable set of bands from all over Europe and the USA.